Have you ever wondered why dogs and cats don't get along? Here's why and what you can do about it! Contrary to popular belief, the world is not divided into “cat-people” and “dog-people”. 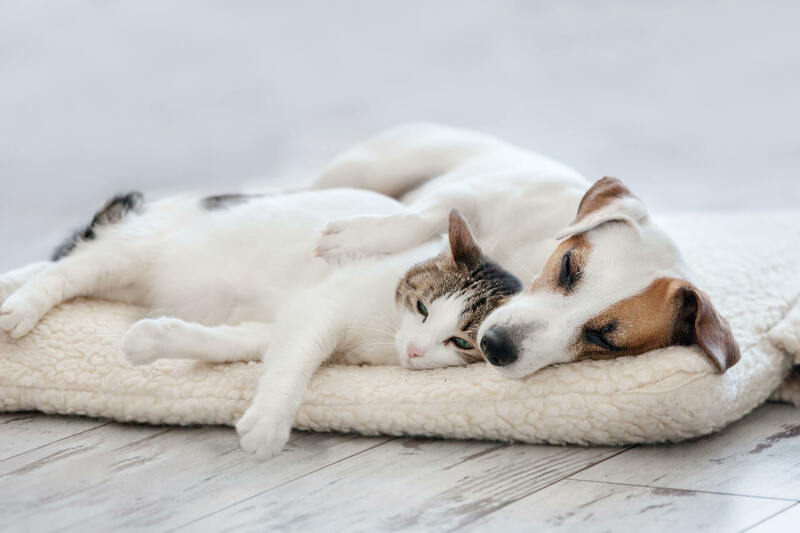 It seems like animal lovers who have a heart for both felines and canines have managed the feat of keeping both in their homes in perfect harmony. But have you ever wondered why do dogs and cats not get along? In short: Cats and dogs have serious, historically established communication issues. These make even a first meeting very difficult. Therefore, understanding where their differences lie and how they developed is a first important step in helping them become friends. To start with, the first cats and dogs that joined the sides of humans many thousand years ago were not the domesticated pets we now know. About dogs: Dogs, who are the descendants of wolves, were very social even then. While their primary motivation for staying close to us was food, dogs might have also valued the company of their first humans. Nevertheless, scavenging human leftovers was always far more convenient than having to hunt. About cats: For cats, who are descendants of the Egyptian Wild Cat, food was all they wanted from us in the beginning. Their ancestors are very solitary animals. Experts still wonder, how such shy animals could develop into our beloved lounge leopards and pet lions. So when wondering why do dogs and cats not get along, take their roots also into consideration. Looking at these lists, it quickly becomes clear why dogs and cats don’t get along and have such a hard time understanding each other. Maybe you are already familiar with the situation when a cat and dog meet for the first time. What can you expect? Imagine your dog wants to be extra friendly when it greets the new cat you bring home. It gets excited, starts running up and down, maybe even barks and once you let it off its leash, it runs at the cat from the side, looks away, sniffs kitty’s behind and wags its tail as hard as it can because it is so happy and excited. Attention: The poor cat would have a heart attack, thinking your dog is about to hunt it down and eat it because, for a cat, all of your dog’s excited and friendly behavior looks threatening and aggressive. Vice versa for a dog. He would probably be very nervous if a cat came walking towards him slowly, staring him right in the eyes. This is a behavior only seen in dogs when they are about to pounce at each other in a fight for life and death. Does this topic concern you? Then check out our additional tips on how to make a dog and cat get along in 7 easy steps! You probably see now, that cat and dog miscommunication is complicated. But no worries, with a few tricks, you can easily train felines and canines to understand each other’s way of communicating. You can read all about making sure your cat and dog get along from day one here. Even with your best efforts, the cat and dog might have a difficult time getting used to each other in the beginning. Maybe one of them gets scared and runs away. Another possibility is that one of them gets jealous and decides to take off for a couple of days. 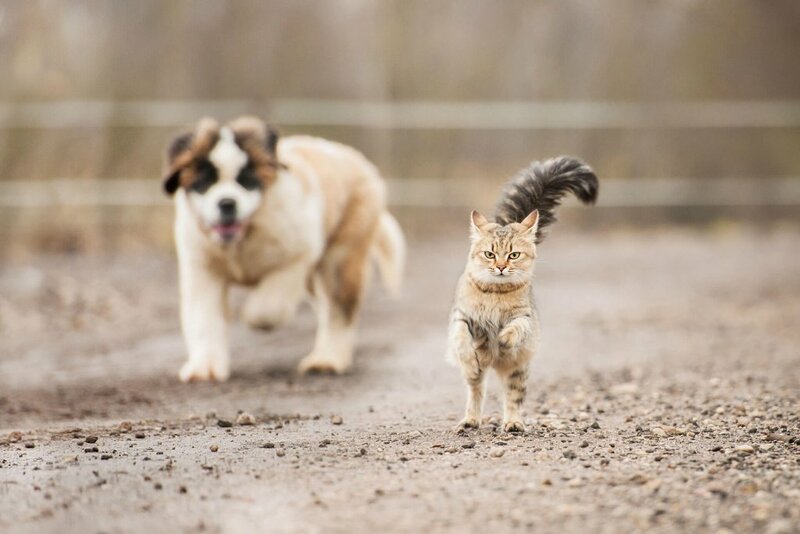 With Tractive GPS Trackers for cats and dogs, you can always know where your beloved pets are. Most noteworthy, you’ll have one less thing to worry about in this sensitive time of having a dog and cat get to know one another. Service Dog – When most needed!